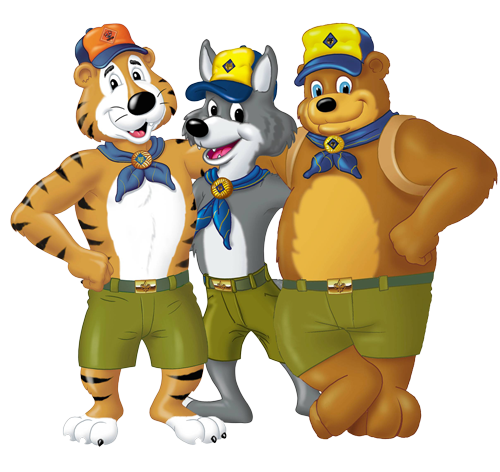 Cub Scouting Uniforms consist of a Shirt, Trowsers or Shorts, Belt, Socks, Cap, Neckerchief and Slide. Depending on the Rank, the uniform changes slightly. Similar to the shirt, a Cub Scout will wear the Blue Trowsers or Shorts up to Webelos. At that point they can switch to the same pants that the Boy Scouts wear. The Cub Scout Belt, shown below, is available with two buckles. One has a Tiger Logo, the other the Cub Scouting Logo. Scout Socks are available in a crew cut or ankle cut. There is a special sock for Tiger Cubs with an orange top. There is a Hat for each stage of Advancement. Just like the Hats, a Cub Scout has a different Neckerchief and Slide for each rank.